Providing you the best range of aluminium foil container making machine, aluminium foil container machine, aluminum foil container machine, food container making machine and semi-automatc aluminium foil container machine with effective & timely delivery. Integration of Gas& Electrical centralized control, automated production. be adjusted freely from 20m to 999m. The machine adopts programmable logic controller (PLC) as the controlling system, it’s reliable. The feeding length, producing speed and other parameter are easily set, this integration of Gas& Electrical centralized control, automated production. The feeding is controlled by stepper system, the feeding length is accurate And can be adjusted freely from 20m to 999m. 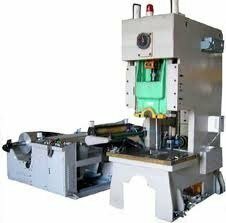 The accurate press adopts steel plates joining body, variable frequency speed regulation, dry type friction clutch-on-off, rigid over-load protector to protect the press. In short, this is a high accuracy and reliability press. Looking for Container Machines ?